Scientists have determined that nobody knows if salt is good or bad for you. You should eat as much of it as possible in case it's healthy. Salt (from the latin "salt", meaning "salta", archaically known as slugsbane, commonly known as chloridum sodii) is a nutritious and tasty drug that makes life worth living. 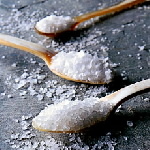 Salt is one of the three "primary flavours" of deliciousness, the other two being fat and sugar. In a 1999 survey, it was estimated that 100% of statistics were about salt. This page was last edited on 25 July 2018, at 22:49.